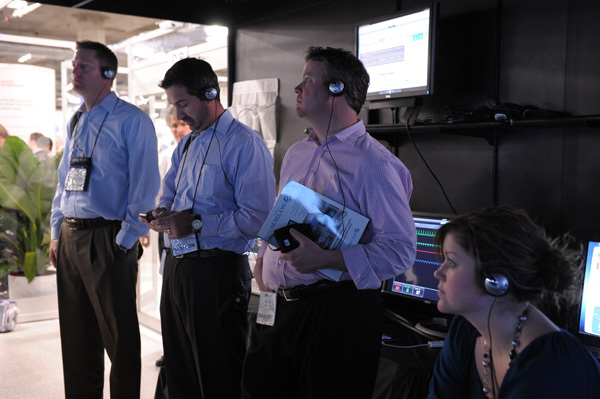 With over 1,100 vendors showcasing their products, the HIMSS12 Exhibit Hall is a marvel. 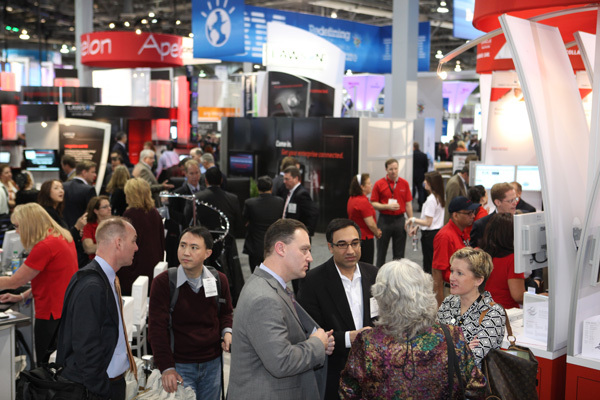 View this slideshow of highlights from the show floor, including new technology, interactive demos and some fun moments. It’s easy to get overwhelmed by the sheer size of the HIMSS12 show floor, but be comforted by the fact that there is something for everyone. 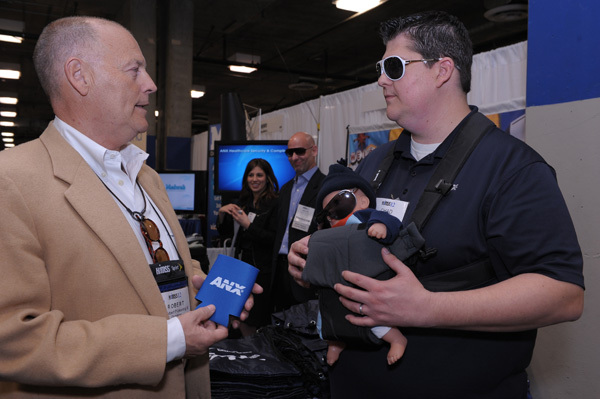 An attendee, inspired by the movie, “The Hangover,” roams the Exhibit Hall wearing some interesting accessories. Attendees get an in-depth demonstration at one of the booths in the Exhibit Hall. Many booths provide free trinkets for visitors to take with them. 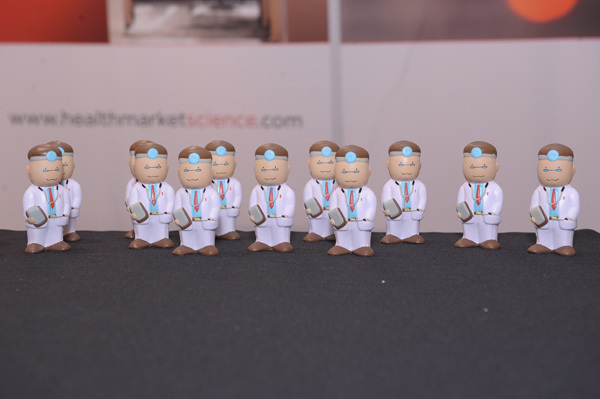 The Health Market Science booth offered these squishy dolls. 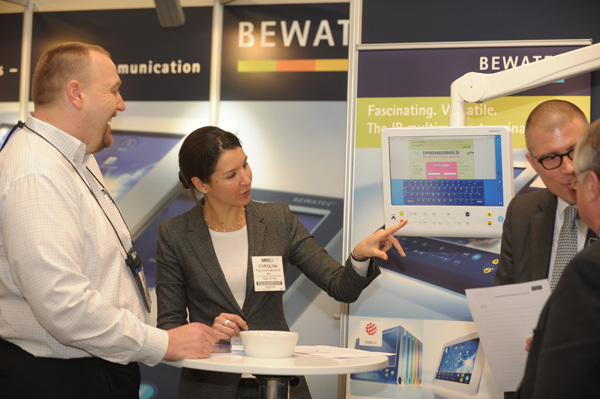 Carolina Frischmuth, of Bewatec, gives a demonstration of the company’s new product offerings. 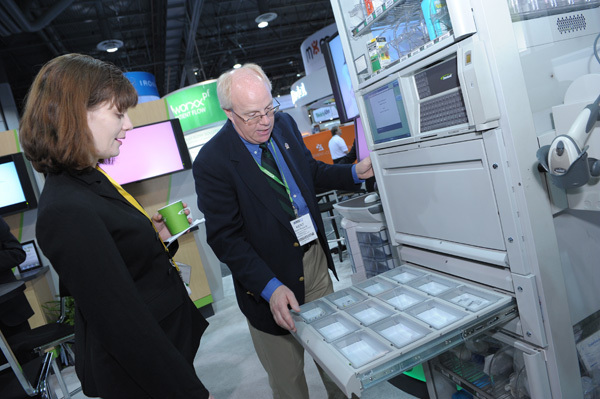 An attendee views a product demonstration on the show floor. 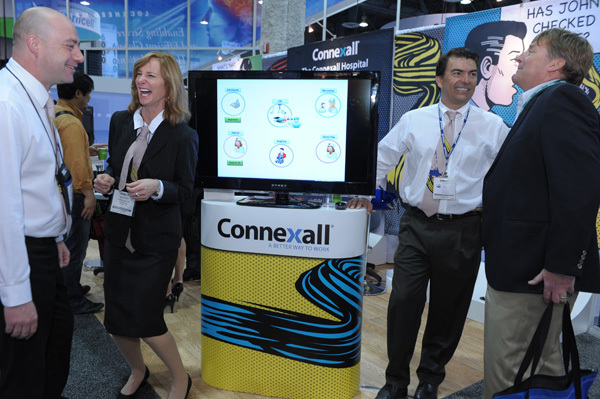 The Roy Lichtenstein style of the Connexall booth pairs well with the cheerful attendees. One booth featured a superhero of a different kind, who poses here with two attendees. Demonstrating a stationary bicycle at the Tibco booth. 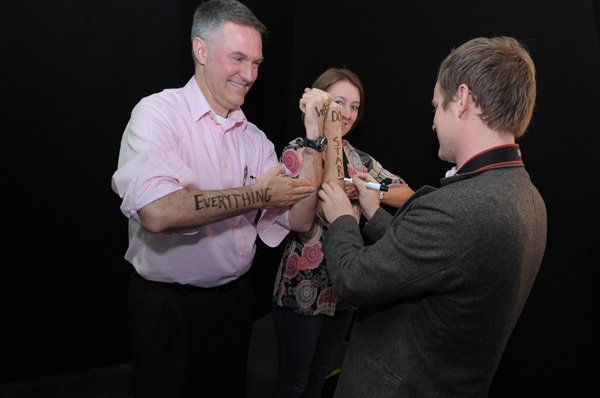 At the Allscripts booth, attendees were able to have an artist write messages on their forearms, and then pose for a photograph. The messages are meant to convey how each individual wants to transform healthcare. Exhibit Hall or Art Gallery? 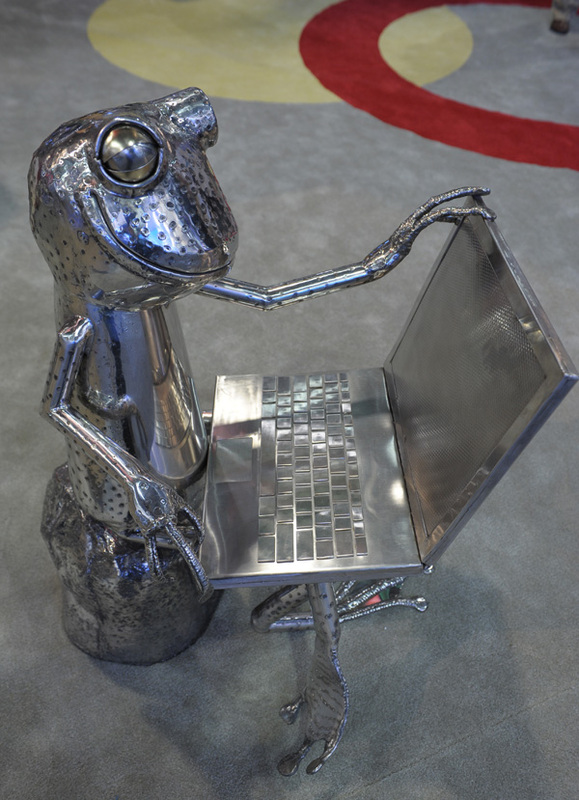 Contemporary art featuring technology motifs was on display at an Exhibit Hall booth. 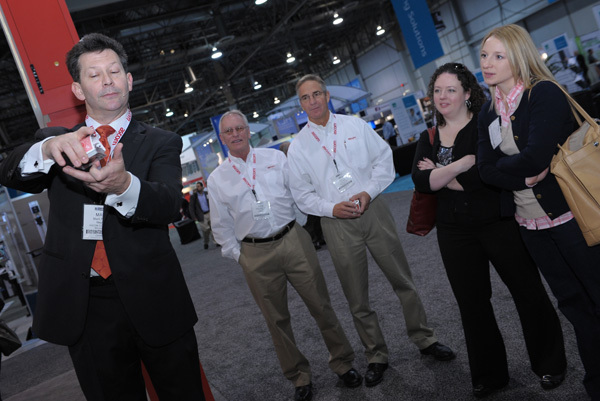 A magician performs sleight of hand at one booth on the show floor. Attendees talk with the ladies of the Nextgen booth.